When I got up Wednesday morning September 28, Zoe was being a bit of a sleepy head. Not her usual up-and-at-’em self. 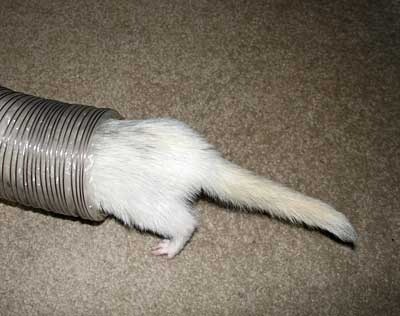 I wondered if she was okay but she ate and tottered off to her usual sleeping spot in the big tube in the hall. When I got home, she had passed away during the day. She was 9 years old. 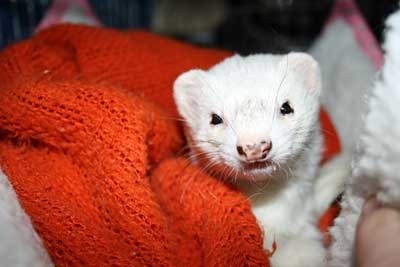 That’s a respectable age for a ferret, equivalent to about 90 human years. I buried her under a little clump of trees in the yard with blueberry bush as a marker. She had been doing so well I had hoped she would make it to 10. It was not meant to be though. She had been active up until the end. She would go outside with the boys when I would let them out for a brief romp outside most days. She had slowed down a lot in her older years and her eyesight was poor but she was still looking good. 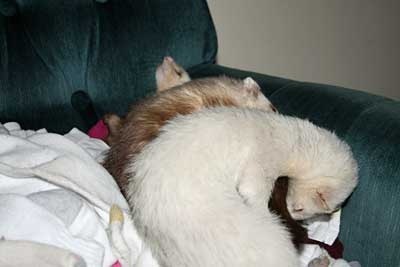 She had seen other ferrets come and go. When something Balt and Phoebe passed away, her solution was what I liked to call "Poop on the World". Since my crew is litter box trained, even when outside they tend to come inside to do their business. But when I would take her outside after a ferret passed away, she made it a point to poop on the patio with a "Take that!" flourish. I’m going to miss her this winter when she would normally be curled up in my lap with Katie. Here’s some of my favorite photos of her through the years. RIP Zoe. 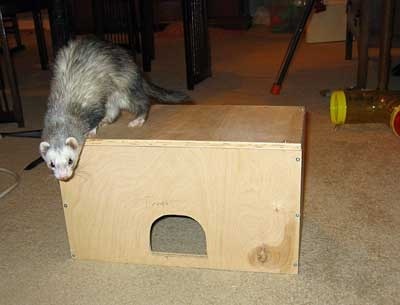 A young Zoe investigating the new ferret play box. Zoe playing in one of the tubes. she was smaller, she could always hold her own in a wrestling match. On another note: I kind of lost my blogging and blog reading mojo for a while there, but I’m going to try to be better. I’m so sorry to hear about Zoe. Oh Sydney, I’m so heartbroken to hear you’ve lost one of your sweet little beings. We’ve missed you by the way – hugs to you and yours from the House of 9 Lives. OH I’m soooo sorry to hear about Zoe. Hugs to all of you. I’m sorry to hear of your loss. i enjoyed hearing about and seeing photos of Zoe. I’m sure you will miss her. If it helps any, I have missed you in blogland. So sorry to read about Zoe. She was such a sweetie! Maybe there’s room for a new addition?